Good News Tennis Families! The match with Stevi has been rescheduled to be played on April 23rd, at 3:00 on the courts here in Dillon. Tennis Families, The home match with Hamilton scheduled for April 16th has been moved to May 7th. It will remain a home match and start time will be 3:00 PM. Good Morning Softball Parents, The games against Butte Central scheduled to play on April 9th in Butte will be played here in Dillon. The Varsity will play at 3:00, JV at 5:00. The games for April 30 will be in Butte. Good Morning Softball Families, The games scheduled for Saturday in Livingston have been moved to Friday in an effort to get them played before the rain comes this weekend. JV will play at 3:00, Varsity at 5:00. JV game first is common in the Central A. Good Morning Track Families, Saturday's meet at Frenchtown on April 6th has been moved to Missoula Big Sky's track due to the large number of participants. Start time remains 9:00 AM. Bus should be loaded and departing BW Lodge by 5:00 AM. The softball match in Hamilton tomorrow, March 30th will be played as scheduled. The bus is scheduled to leave the BW Lodge parking lot at 8:30. Good luck softball girls. The home tennis match against Butte Central scheduled for tomorrow has been canceled due to snow covered courts. We will attempt to play it on April 11th starting at 2:00PM. Boys basketball banquet will remain scheduled for April 2nd but the location will be changed to the BW Lodge foyer. Time will be from 6:30-8:30 as previously scheduled. The banquet will not be at Parkview Elementary. We will not be attending the track meet tomorrow in Corvallis. Bad weather and snowy conditions on the ground there lead the track coaches to opt out. Stay tuned for more spring sports updates. The boys' basketball banquet scheduled for this Wednesday has been moved to next Tuesday, April 2nd from 6:30-8:30 at the Parkview elementary lunchroom. Due to conflict with newly scheduled track meet in Corvallis this week. The home tennis match vs Butte Central scheduled for Saturday will go as planned. Thanks to all the amazing volunteers for the hours you put in on the end of a snow shovel or wheelbarrow. Our athletes and coaches are enjoying the fruits of your labor! The softball games in Hamilton this weekend will be played as scheduled. The varsity track meet scheduled for Wed in Corvallis will go on as scheduled. Athletes and coaches should arrive there at noon with events starting at 1:00. Good Morning All, Track families heads up. If you are looking at the printed schedules you need to know all meets in Hamilton are canceled this spring as their new facility isn't ready. We are in Frenchtown on Friday the 29th provided the snow melts in time there. If the track in Corvallis is clear of snow by Wednesday Mar 27th we will have our first track meet in Corvallis. Start time for that meet is 12:30. This is a varsity only event. Good Morning Beaver Fans, The track and tennis contests scheduled for Saturday, March 23rd have been canceled. No word on re-scheduling at this time. The Gene Hughes track meet on Saturday March 23rd has been canceled. We are hoping to get as many people as possible to help clear snow off tennis courts today at 3:45 near the middle school. If you can come please bring a plastic shovel and if you have a wheel barrow or a large sled to haul snow that would help. PROM: Change of time and day for Tux fitting at school. The new time is Thursday the 7th during lunchtime.Please stop by the office and get your name on the schedule so we know how many to expect. PROM News: Thomas' clothing is coming down from Butte to BCHS at lunchtime on Tuesday March 4th. Sign up in the office on Monday to get fitted for a Tux. They will drop off and pick up here so no trip to Butte needed! The FFA trip leaving for Conrad today has been canceled due to extreme winter weather conditions for the next 48 hours around Conrad and Great Falls. PROM has been scheduled for March 15th from 8 to 11. Come enjoy some music and dancing "Under The Sea!" Spring sports parent and student athlete meeting will be Tuesday March 5th at 7:00 PM in the BW Lodge Gymnasium. If you are interested in spring sports please be there. Music trip to Missoula today canceled due to bad weather and roads. Students are unloading the bus now in the gym parking lot. 3 Wrestlers in the Semi-finals in Billings. Cooper, Luke and Noah good luck on Saturday! Stevi notified us last night that girls C-Squad in Stevi will be delayed 30 min. Other games will be played as scheduled. For girls C-Squad parents. The game for tomorrow January 26th will be delayed 1/2 hour and start at 1:30 instead of 1 :00. Girls C-Squad team will play at 1:00 on Saturday the 19th instead of 1:30. We have enough players to play a full game as scheduled. Good Morning, The girls C-Squad team had an injury last night that leaves them short handed for Saturday's game. (JAN 19) As a result we will play an abbreviated game and start at 1:30 instead of 1:00. Hi Folks, The C squad games today in Butte will be at the civic center on the old court in the back. Girls at 2:30 boys after. C-squad games for Monday the 7th in Twin Bridges will be moved up an hour. The boys will play at 3:30 and the girls at 5:00. Good Morning All, This message is for the C-Squad parents both boys and girls. Butte Central does not have a girls C-Squad team so that game has been canceled. This means the boys C-Squad game has been changed from 5:30 to 4:00PM today at Butte Central. Happy New Year BCHS families! We are back in school tomorrow. Make sure you are getting any makeup work turned in as we are just a short time from the end of the semester. Winter sports teams back in action this week. Check the calendar for your team's schedule. Wrestling canceled for tomorrow Tuesday, December 11th. We will look to reschedule the meet with Corvallis in January. 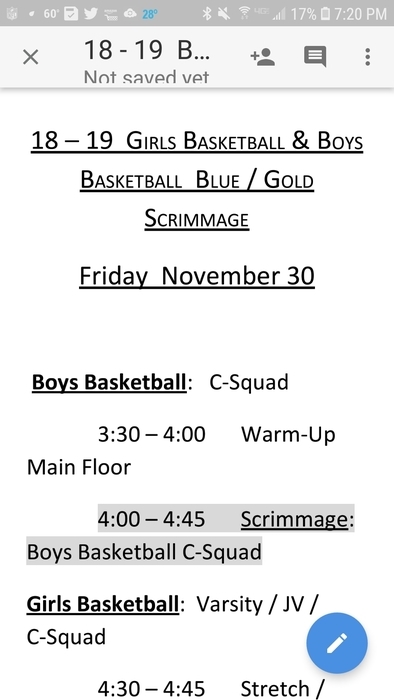 BLUE GOLD BASKETBALL SCRIMMAGE FRIDAY! Good Morning All, We have a short week with early release on Wednesday and out Thursday and Friday. Winter formal is coming up on Saturday Dec 1st. The wrestling team is in Livingston that day. Friday the 7th the boys and girls basketball teams are at Tipoff tourney in Missoula. 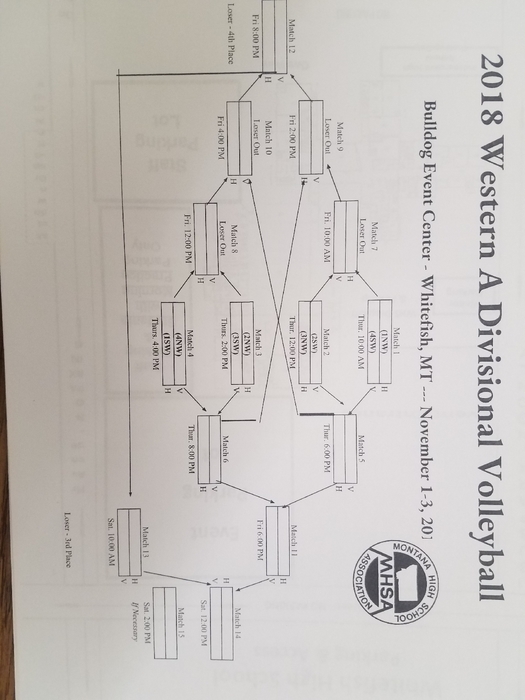 Good luck Beavers volleyball team at the Divisional tournament in Whitefish next week. Football Fans! The froshmore game today will be on the practice field. You may want to bring a chair. Parent Teacher Conferences Tuesday Oct. 9th and Wednesday Oct. 10th. from 5:30pm to 8:30pm. We are hosting our annual Parent Teacher Conferences on the nights listed above. School will be on Early Release both days, letting out at 2:37pm, and buses will run at that time. Football Fans, this announcement is for you! Froshmore football team is playing Butte High this Thursday October 4th at 4:15 on Vigilante Stadium. Should be a great game so come on down! Sorry folks Monday's Football game at Stevensville has been cancelled. They have some injuries they can't get around and put a JV team together. Monday's froshmore football game in Stevensville is a go. Just got confirmation from the A/D there. Now that the renovation to the main building is almost complete, we will start to utilize our security systems and protocol for visitors wishing to access the main building. Therefore, starting Thursday the 20th all visitors will have to be buzzed in by our office staff. Football Fans! There is construction underway at MT Tech. The southwest parking lot will be closed for our game up there this Friday night. There is parking to the Northwest near the library or to the east of the field. See you Friday Night!! Parents of seniors; The Jostens rep was in the auditorium this morning talking to your students about graduation gear. Please make sure to connect with your son or daughter on what you want to purchase and he will be back next week to take orders. Dual Enrollment Meeting Wednesday, September 5th 7:00 pm Montana Western Main Hall 215 Call UMW School of Outreach at 406.683.7537 for questions or more details. To get access to the 2018-19 Activity Packet & Forms and the Activity Schedules please go the our school app or website and navigate to Menu>Documents>Extracurricular Activities>Activities Director. ATTENTION 2018 SENIORS: Graduation pictures are available at https://bchsmt.smugmug.com/Graduation-2018. The password to get into the site is gobeavers. Attention Track Athletes: Please bring $10.00 to the office by the end of the day today for coaches gifts. Baccalaureate will be at 7:00 PM in the BCHS Auditorium on Saturday, May 26. Seniors please make sure you are there by 6:50 PM. Tomorrow, May 23 is our final physical clinic at the BW Lodge. Barrett Hospital medical providers will be doing physicals for students who need them to participate in the 2018-2019 activity year. Physicals are required for all students participating in any athletic activities at BCHS. Please call the high school (406-683-2361) office to make an appointment. The phsical clinic is for all incoming 7-12 grade students, it starts at 5:30 PM and goes until 7:30 PM. Attention Seniors: Please do not forget your graduation cap and gown tomorrow, May 22. You will need them if you want to participate in the “Graduation Walk” through the DMS and Parkview Elementary. ATTENTION SENIORS AND SENIOR PARENTS: Please note the following times and dates for upcoming important Senior activities: Monday, May 21--Senior Awards Night in the BCHS Auditorium @ 7:00 PM Saturday, May 26--Baccalaureate in the BCHS Auditorium @ 7:00 PM (Seniors please arrive by 6:50 PM.) Sunday, May 27--Graduation in the BW Lodge Gymnasium @ 2:00 PM (Seniors please arrive by 1:00 PM.) Please call the high school office if you have any questions. Due to the potential for bad weather at the divisional tennis tournament, we will be changing the start time on Thursday to 10:00 AM instead 1:00 PM. 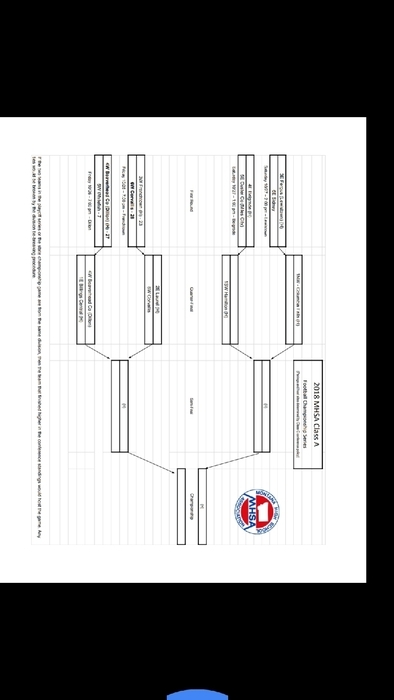 Again, the Divisional Tennis Tournament will start on Thursday, May 17 @ 10:00 AM. If you have any questions please call the high school office. Dillon area incoming 7-12 grade students and parents, please remember to sign up for your 2018-2019 physical at the high school office. Barrett Hospital will be having 2 physical clinics on Wednesday, May 16 and Wednesday, May 23 from 5:30-7:30 PM. If you are interested, please call the high school office at 406-683-2361 to schedule your appoinment. This physical will be good for the whole 2018-19 Activity year. ATTENTION SENIOR PARENTS: There will be an after graduation senior party planning meeting on Tuesday, May 8th at 6:00 PM in the BW Lodge Seminar Room. If you have any questions please contact the high school office. The JV softball game vs. Park scheduled for tomorrow, May 8 has been cancelled. We will still play the varsity game at 4:00 PM. We will honor our seniors prior to the start of the varsity game. On Monday, May 7, Beaverhead County High School is hosting an All-School Assembly entitled “The Walking Man”. This assembly is designed to raise awareness on Mental Health Illness, Substance Abuse, and Suicide Prevention. Parents, due to the topics being covered you can opt your child out of attending this assembly by calling the office Monday morning and notifying Mrs. Ferris. I will be sending out a Robo call Sunday evening notifying parents of the assembly and their option to opt their child out of attending this assembly. The tennis match vs. Hamilton that was scheduled for today has been cancelled. We have rescheduled the match for Tuesday, May 8 at 2:00 PM in Dillon. Barrett Hospital providers will be offering Sports Physicals for all incoming 7th-12th grade students, at the BW Lodge Gymnasium on Wednesday, May 16 and Wednesday, May 23, from 5:30-7:30 PM. These physicals will be good for all 2018-2019 sport seasons, fall, winter and spring. If you are interested in signing up please contact Mrs. Ferris in the high school office. All students participating must be accompanied by an adult at their appointment. The contact number for the high school is 406-683-2361. We have rescheduled the tennis matches with Park and Stevensville for Thursday, April 26. We will play Park at 9:30 AM, and then play Stevensville at 2:00 PM. Please call the high school office if you have questions. The tennis matches scheduled on Monday, April 23 have been cancelled due to the poor weather forecast. If you have any questions please call the high school office during our regular business hours. Tennis matches scheduled for tomorrow, April 17 vs. Stevensville and Hamilton have been cancelled. These matches will be rescheduled for a later date. If you have any questions please call the high school office. The softball game scheduled for today in Butte (vs. Butte High JV) has been cancelled due to extreme weather. We will try to reschedule for a later date. If you have any questions please call the high school office. ATTENTION SENIOR PARENTS: All senior party raffle tickets need to be turned in by the end of this week, Friday, April 13. They can be turned into the high school office. The office closes at 3:00 PM on Friday! The softball game scheduled for tomorrow, April 12 has been cancelled due to weather. We have reschedule this game for Thursday, April 26 ( Varsity @ 4:00 PM and JV @ 6:00 PM). If you have any questions please contact the high school office. Attention Senior Parents: There will be an after graduation senior party planning meeting tonight, April 10 in the BW Lodge Seminar Room at 6:00 PM. If you have any questions please call the high school office. Softball game times in Butte (vs. Butte Central) on Thursday, April 12, have been changed to Varsity at 4:00 PM and JV at 6:00 PM. If you have any questions please call the high school office. The tennis match scheduled for tomorrow at Polson has be canceled. 2018 BCHS Preseason SPRING Parent/Student Sports Meeting Track (Boys & Girls), Tennis (Boys & Girls) & Softball (Girls) Tuesday, March 6, 2018 7:00 PM @ B.W. Lodge Gymnasium Required for students trying out for a SPRING sport, and strongly encourage for all parents to attend. 1ST Day of Track, Tennis and Softball is Monday, March 12, 2018 All practice and tryout information will be provided at the Spring Parent/Student Sports Meeting. Please call the high school office if you have any questions. 8th Grade Registration Night at the high school will be at 7:00 PM in the BCHS Auditorium on Wednesday, February 28. 8th Grade Registration night is for all 8th graders who are planning on attending Beaverhead County High for the 2018-2019 school year. We will hand out registration and honors testing information, talk about graduation requirements, introduce faculty, and go over how to register for classes. If parents or students have any questions they can call the high school office at 406-683-2361. A robo call recently went out to all senior parents to inform them that there will be a senior graduation party planning meeting on Tuesday (February 13) evening. Senior parents if you did not get the message and want the details please call the high school office Tuesday morning during regular school hours for more information. JV girls and boys basketball AT Butte High today. Girls @ 5:30 PM and Boys @ 7:00 PM. Call the high school office if you have questions. The start time of the girl’s c-squad basketball game on Thursday, January 25, in Frenchtown will be at 4:45 PM. 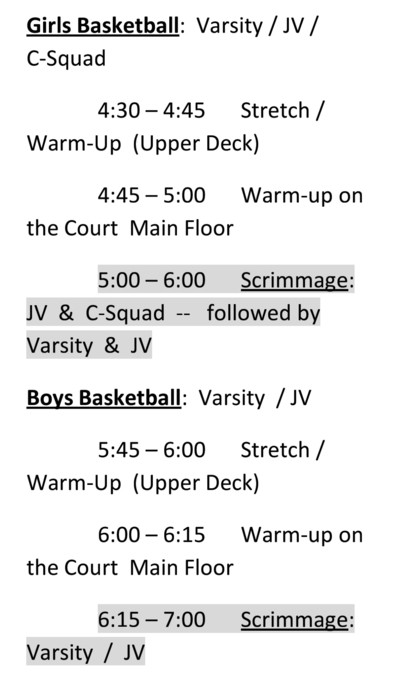 The JV and varsity games will be played at the regular scheduled times. JV @ 5:45 PM and Varsity @ 7:15 PM. The boys games in Dillon will be played as scheduled. If you have questions please call the high school office. Wrestling tonight will start at 6:30 PM at the BW Lodge. Tonight will also be senior night. There will not be a c-squad girls basketball game in Helena, the JV game will start at 3:00 PM and the girls Varsity game in Helena starts at 4:30 PM. The boys will play in Dillon at 1:00/2:30/4:00 PM. A robo call was just sent out to all parents at BCHS reminding everyone that semester finals will start tomorrow, January 17. All of the information discussed in the call can be found in the letter that was sent home last week. 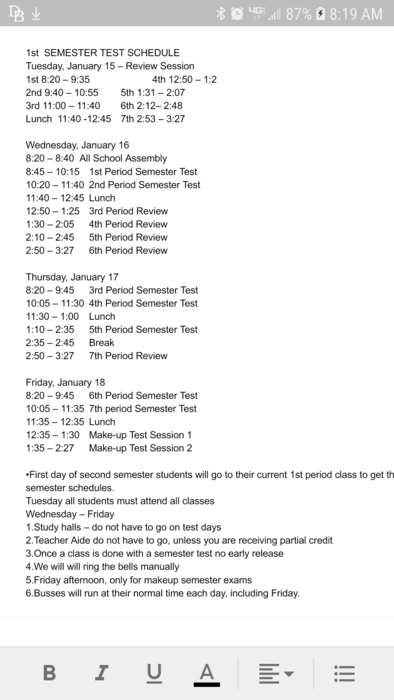 If you have any questions about semester finals and/or the schedule please call the high school office at 406-683-2361 during the regular school day. The office opens at 7:30 AM. Just a reminder that the JV basketball games vs. Butte High will be played in Dillon at the BW Lodge gumnasium today, January 9. The boys will play at 5:30 PM and the girls will play at 7:00 PM. The JV games schedule on Monday, February 5 will now be in Butte. Please call the high school office if you have questions. The JV basketball games scheduled in Butte tomorrow, January 9 have been moved to Dillon. Both the JV Boys and JV Girls will play Butte High IN DILLON (BW Lodge) tomorrow, January 9. The boys will play at 5:30 and the girls will play at 7:00. Please call the high school if you have any questions. BCHS Key Club will host the 2017 Winter Formal this Saturday, December 2nd, from 8:00 to 11:00 PM in the Green Gym. Grand March will be at 9:00 PM. We would like to remind parents that there is a food pantry available to students here at the school. The BCHS Food Pantry is here to be a resource to any families with students who attend BCHS. If you have questions about the pantry or would like more information, please contact Jacklyn Bertelsen, School Counselor. A reminder to Seniors and their parents that the priority deadline for the FAFSA (Free Application for Federal Student Aid) is fast approaching on December 1st. This important form is available at fafsa.ed.gov and must be completed for your student to be eligible for federal and state aid for college and also qualifies them for certain institutional aid. If you have questions, please contact the BCHS counseling office. We will have having our Winter Sports Parent/Student meeting on Tuesday, November 7 @ 7:00 PM in the BW Lodge Gym for anyone interested in trying out for boys/girls basketball and wrestling, and also those participating in the winter cheerleading season. Due to the weather and condition of our game field, today's froshomore football will be played on the practice field @ 4:30 vs Stevensville. Froshmore Game Cancelled_The Froshmore football game scheduled for Monday, September 25th at Butte Central, has been Cancelled. Volleyball is AT Anaconda today. Game times are at 4:00/5:30/7:00. Again, the matches are Away AT Anaconda. The cross country meet in Anaconda-Discovery scheduled for tomorrow has been cancelled. Due to Inclement weather Saturday's Cross Country Meet @ Anaconda/Discovery that was scheduled for Saturday September 16 has been rescheduled for Monday, September 18. Monday's rescheduled meet will start @ 11:00 am. Due to the weather, we have decided to cancel the Dillon Invitational Golf Tournament scheduled for today at the Beaverhead County Golf Course. Due to smoke in Hamilton, today's Froshmore Football game will be played in Dillon at Vigilante Stadium @ 4:30 pm. Just a reminder to all Students and Parents: No School Thursday August 31 - Monday September 4th. School will resume with regular classes on Tuesday September 5th. Today's Cross Country Meet at Butte Central has been canceled due to smoke.